I could have sub-titled this one, Top Ten ways to combat food fatigue, so you don’t get tired of your own cooking and blow the budget going out to eat. That was even wordier than the title I chose, though, so… um… yeah. This is my list of foods, mostly condiments, that add zing to plain, old, homemade-from-scratch food. When you do most of your own cooking, things have a tendency to start tasting the same day-in and day-out. We may not be in a rut exactly, but our own cooking starts to lose it’s appeal. The family groans because it’s “Spaghetti again!” Restaurant food, or even fast food, starts looking pretty appetizing compared to anything we might cook ourselves. I call this food fatigue. It’s something most budget-minded cooks have to combat now and then. Food fatigue can be disheartening and discouraging, but it tends to pass after a time. Instead of giving in to the temptation to blow the budget on a meal out, I have learned to change up what I’m making now and then, to keep myself from falling into a rut. It keeps my everyday meals tasting special, without hurting my budget. These foods add very little extra cost to my weekly grocery total, certainly less than a fast-food meal for 1, much less the whole family. 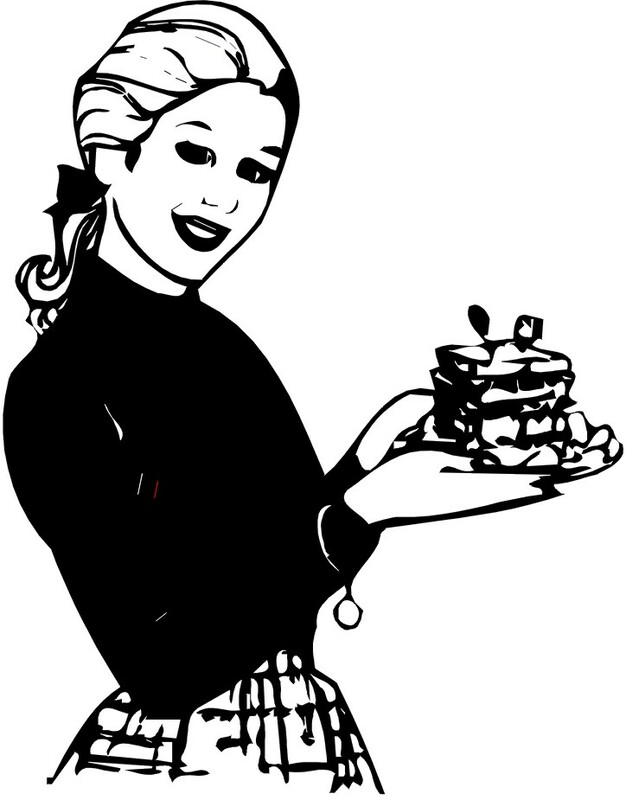 They keep my food tasting good so I can keep food fatigue at bay and they allow the taste of my own cooking to remain appetizing. I bet most of you already thought of this one yourselves. That’s because it really works. Fresh garlic just tastes better than garlic powder. That’s not to say I never use garlic powder. If you’ve read my blog for long, you’ve seen garlic powder called for in dozens of my recipes. I use it because it’s so affordable and convenient. Fresh garlic though, it adds an element of flavor that garlic powder lacks. Fresh garlic bulbs are very affordable. You can buy them in bunches or by the bulb. Each bulb has several cloves of garlic within. After you separate a garlic clove from the bulb you have to peel it and chop it. Do this by laying the garlic clove on your cutting board and then laying the flat of your knife over the clove. 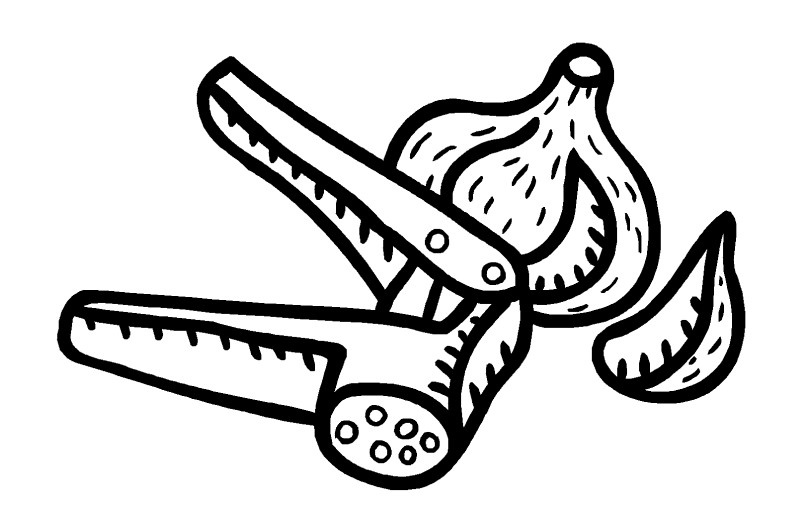 Hit the flat of the knife quickly with your fist, smashing the clove of garlic. This makes the peel come right off. Then you can chop the garlic into tiny bits. There are also handy gadgets called garlic presses that make mincing garlic pretty easy. Another option is to buy minced garlic in jars. This is the way I do it. The minced garlic tastes just like fresh and can be measured out by the spoonful. To replace garlic powder with fresh garlic, the general rule is to use 1-clove of garlic or 1-teaspoon of minced garlic for every 1/8-teaspoon of garlic powder. An 1/8-teaspoon is half of a 1/4-teaspoon. So if your recipe called for 1/2-teaspoon garlic powder you would use 4-cloves of fresh garlic or 4-teaspoons of minced garlic. This may seem like a lot of garlic, but 1/2-teaspoon garlic powder really does give you a lot of garlic flavor. Garlic tastes best if it sautés for a minute or so in hot oil. 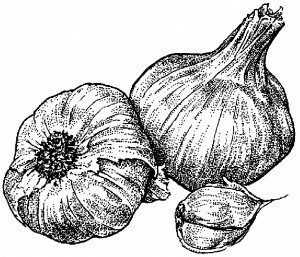 Burnt garlic can have a bitter flavor so avoid burning your fresh garlic. If your recipe doesn’t allow for frying the garlic, such as if you’re adding it to a meatloaf, don’t worry about it. Baking in the oven will bring out the full flavor, and sometimes raw minced garlic adds just the right note to a raw recipe or homemade salad dressing. The first time I tasted freshly ground black pepper I was in my mid twenties and it was like tasting pepper for the first time. I had a new mortar and pestle and a small jar of whole peppercorns I had found at Big Lots. I sprinkled a few peppercorns into my new mortar, ground them with the pestle and tasted it. It was a-MAZ-ing. I made fish chowder that night, which is heavy in black pepper, and it was the best I’d ever made. I still grind my black pepper in my old mortar and pestle. Actually, I don’t. My oldest son, the one with Asperger’s, does it for me. He loves to use the mortar and pestle. One day I may own my own pepper mill, but so far I haven’t been willing to fork out the cash for one when my mortar and pestle works so well. You can also grind them in an electric coffee mill. 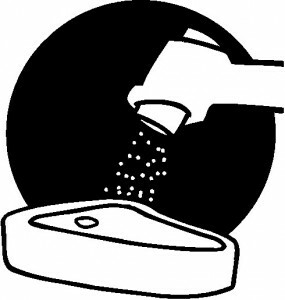 After grinding, store in a well sealed container or small jar. 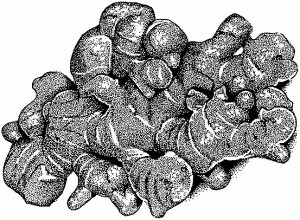 Peppercorns can still be found at Big Lots, and are widely available in most supermarkets. Larger containers usually cost less per pound. I buy large containers of plain black peppercorns from Sam’s Club. If you want to get fancy you can also find white peppercorns, green ones and red ones. They’re very pretty and have slightly different flavors, but for the most part, regular black pepper works just as well when you’re on a budget. I use regular store-bought ground pepper for many things because of convenience and affordability, but when I’m trying to make a dish taste as good as I absolutely can, I use fresh ground black pepper. It really does taste that much better. These are simply run-of-the-mill jalapeño peppers that have been smoked and dried. 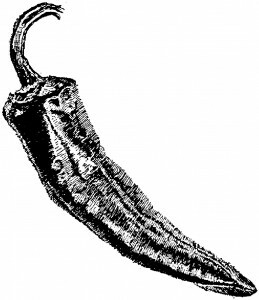 The smoking process mellows jalapeños and gives them a deep smoky flavor that is unlike anything else. I use them a lot because they make homemade food taste new and different and better. You can buy them in whole dry form at some markets, usually in the Latino section. They can also be found canned in adobo sauce. This is often the easiest to find. The cans are small–usually 7 to 8-ounces. You can also find chipotle hot sauce, in a jar like Tabasco sauce. In the spice aisle you can find ground chipotle, or even Mrs. Dash chipotle flavored salt-free seasoning. Sometimes you can find jars of chopped chipotle in adobo sauce, similar to the jars of chopped or sliced jalapeños. Since chipotles canned in adobo sauce are the easiest to find, even dollar stores carry them, they are the type I use most often. After opening the can, transfer the contents to a clean jar. I use a wide-mouth 8-ounce canning jar. Scoop the peppers and their sauce into the jar and store them in the fridge for several months. When you need chipotle simply remove a pepper and mince it finely with a knife on your cutting board. Some people place the contents of the can into a blender and puree it up, or you could use a hand blender I suppose. This would save the time of chopping the chipotle every time you need it, but I do hate to wash my blender so I just chop them as needed. Chipotle varies in heat. Some of them are very hot, others not so much. You really need to taste as you go when using them. I add them to chili, tacos, meatloaf, chicken stir-fry, pinto beans, anywhere that a Mexican flavor and some spicy heat would be appropriate. Sometimes I stir it into store-brand barbecue sauce to spice it up a bit. My oldest son has become particularly fond of this. It can also be stirred into mayonnaise and used as a dip or spread on burgers, or any sandwich really. Chipotle is one of the best quick fixes for food fatigue I’ve found. I can’t afford fresh lemons very often. They taste very good, but when they’re more than 50¢ a piece I choose to make do with inexpensive bottled lemon juice. Lemon juice adds just the right note of citrus and sour to lots of dishes. You can add a few drops to curry sauce, to give it a pleasant tang. Lemon has a special affinity with both chicken and fish. Use it as a marinade or sprinkle it over fish or chicken before baking. In most recipes calling for vinegar (itself a low-cost flavor-booster) you can replace it with lemon juice. Seventh Day Adventists, many of whom do not use vinegar, have used lemon juice instead of vinegar for over a century. In salad dressings lemon juice can be especially tasty. When you’re trying to give a sauce a cheesy flavor, without using cheese in the process, lemon juice can add a bit of the flavor of sharp cheddar. I have a favorite recipe for cream of broccoli soup that I always add lemon juice to, to give an approximation of cheddar in the soup. Adding lemon juice to any recipe that calls for canned tomatoes can give them a flavor closer to that of fresh. If you are substituting bottled lemon juice for fresh, it takes about 3-tablespoons of lemon juice to make the equivalent of the juice from a fresh lemon. You can add 1/2-teaspoon sugar too, to make it taste closer to fresh. Fresh lemon juice has a slightly sweet flavor that bottled doesn’t reproduce exactly. By adding a small amount of sugar to your bottled lemon juice you can reproduce the flavor of fresh lemon juice without the cost of a fresh lemon. If you haven’t made any desserts with lemon lately, you might want to give it a go. Lemon juice can be used to flavor icing, cake, muffins, and makes illegally delicious lemon bars. From desserts to main dishes, salads to sauces. Lemon juice adds a piquant flavor and fresh zest to your home cooking. All right, I’m going to be honest with you. Soy sauce is pretty much liquid MSG. Fermenting soybeans makes them full of glutamic acid which in turn is full of the sodium salt called monosodium glutamate (MSG). Naturally fermented soybeans have naturally occurring MSG in them. It’s just a fact of life. 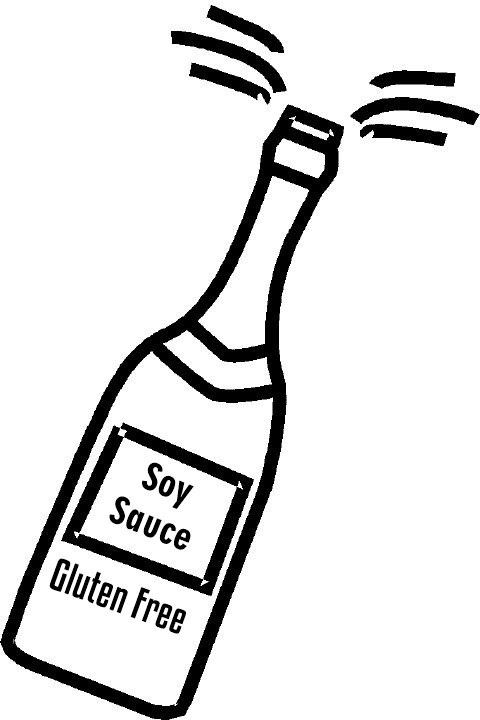 Some gluten free soy sauces are made from hydrolyzed soy protein (such as La Choy and Kroger store-brand). This also contains naturally occurring MSG. 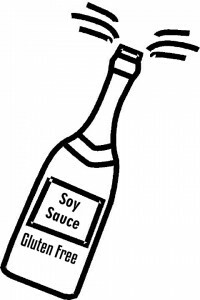 MSG is not added to most soy sauce, because they don’t need it, because they are swimming in it already. Even 100% traditionally brewed, all-natural, organic, gluten-free soy sauce contains naturally occurring glutamic acid, which is MSG. And I’ll tell you, it makes food tastes good. I don’t use commercially available MSG like Accent in my kitchen. I try to choose foods which don’t contain added MSG. But I do use soy sauce in a lot of my dishes because it makes them taste better. Which, if you look at it a certain way, is almost like adding MSG. Some people have a very strong reaction to MSG. Thankfully, my family does not. So I do use soy sauce, or Bragg’s Liquid Aminos (a non-brewed soy sauce substitute) and I make no apologies for it. Soy sauce added to ground turkey, gives it a beefier flavor. Soy sauce added to vegetarian dishes, gives them a succulence that nothing else can duplicate. I use it in place of salt in many dishes, especially those with beans or lentils. Since soy sauce is so high in sodium, I tend to use a low-sodium version. A reader also pointed out that you can dilute regular soy sauce yourself, half and half with water, and get the same thing for half the price. If you’re avoiding all MSG, then steer clear of soy sauce. If you want your food to taste better–fuller, richer, more appetizing to the family–then try adding a little soy sauce to whatever you’re making for dinner, and see if it works for you. I could eat fresh ginger every day for the rest of my life and die a happy woman. My children feel differently. They will tolerate fresh ginger in a handful of Asian dishes, but for the most part, they don’t love it like I do. I use fresh ginger in my Chinese dishes, the same way I use chipotle in my Mexican food. I simply add a bit, to taste, and otherwise prepare the recipe as written. Fresh ginger has a zest and sparkle that ground ginger simply can’t replicate. I often use ground ginger just because it’s cheaper, easier to keep on hand, and terribly convenient. When I have it though, fresh ginger tends to blow diners away. 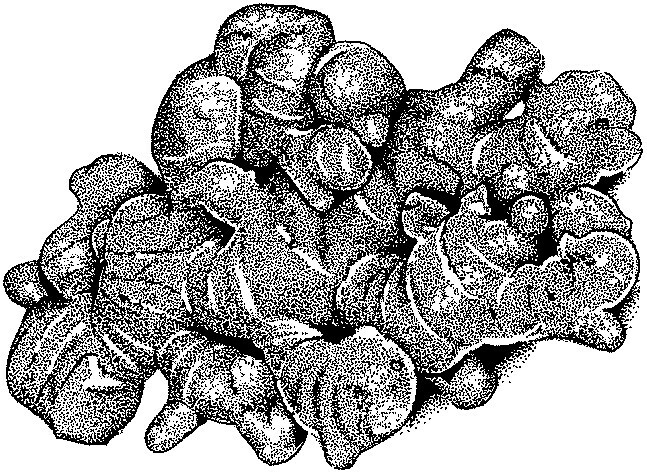 Fresh ginger is a gnarled root, called a hand. If all the hands of ginger in your market are too large, you can break off a piece and buy as little as you need. Most sources say it should be peeled before shredding or mincing. I am lazy, so I don’t usually peel it. I just shred it on my cheese shredder and use it like that, peel and all. Ginger should be kept in the refrigerator, where it will keep for at least a couple of weeks. If you buy a lot of it at once, you can shred it or chop it in a food processor and then spread it on a cookie sheet and freeze it. Gather up the shreds after they are frozen and store in a bag in the freezer. Use as needed. Another option is to shred it and store it in a jar filled with sherry in the refrigerator. Fresh ginger does dry out over time, so if you use it often, it pays to preserve it by freezing or pickling in sherry. If you’re swapping fresh ginger for dry, or vice-versa–the ratio is 1-tablespoon of fresh shredded ginger to 1/4 to 1/2-teaspoon dry ground ginger. It depends on the age and strength of your dry ginger. Some types are stronger than others. When you don’t have fresh, feel free to use dry. But if you do have fresh, by all means put it to good use. 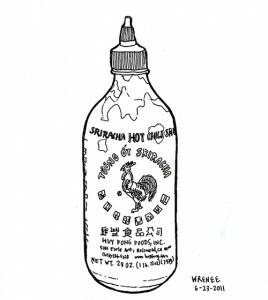 Also known as rooster sauce because of the picture of the rooster on the bottle. It’s so popular these days that you can even find store-brands. It originated in Thailand and has recently become extremely popular in the US. It’s an Asian style hot sauce that tastes very different from Louisiana or Texas style hot sauces. I add it to Asian dishes such as stir-fries or Lo Mein noodles. I also add it to mayonnaise when I want something kickier than regular mayo. It’s amazing on a turkey sandwich. My favorite thing to do with it though, is to add it to deviled eggs. My heavens! What it does to deviled eggs should not be legal. I have had more compliments on my sriracha deviled eggs in the past couple of years than I would have ever thought possible. If you’re tired of the same-old-same-old hot wings, try making them with sriracha instead of regular hot sauce. It gives them a subtle Asian flair. My kids put it on their buttered rice, scramble eggs and shake it on plain roasted chicken. They put it in fried noodles and fried rice. They add it to tacos and one time even tried it on canned pineapple. It gave the pineapple an odd barbecue flavor that I didn’t care for, but the kids ate every bit and swore it was good. 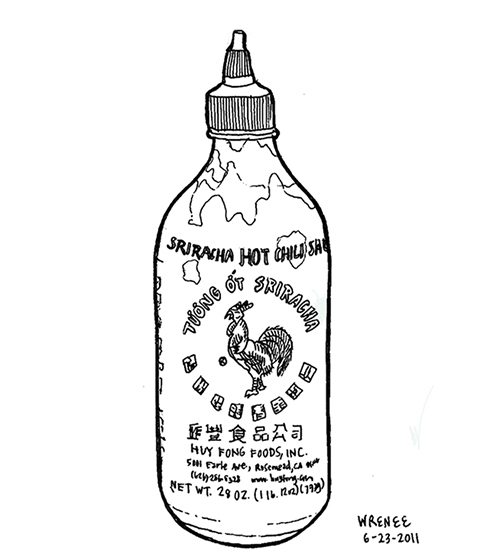 Sriracha costs about the same as other hot sauces, so it’s affordable as well as flavorful. Brown mustard costs more than yellow mustard, but is cheaper than Dijon mustard. I regularly use it in place of Dijon mustard in cooking. Brown mustard is like a grown-up version of yellow mustard. It has a grainy, thick texture and a more complex flavor than simple yellow mustard. I add it to soups, stews, casseroles, baked beans, salad dressing, meatloaf, meatballs, even gravy. Since the flavor is so bold, it’s wise to use a gentle hand. Add a tiny bit–taste–add more if desired. Be careful not to over do it. When you can’t have cheese, a little bit of mustard added to a sauce can give you a depth of flavor similar to a good cheddar. It’s not cheese, but it has the piquant bite of a good cheddar, which can be surprisingly toothsome. You can make your own honey mustard by mixing 2-parts of honey to 1-part of mustard. If a tablespoon is your “part” then use 2-tablespoons honey to 1-tablespoon of brown mustard. Stir together and use as desired. Or make your own honey mustard sauce by using 2-parts mayonnaise to 1-part honey and 1-part mustard. If 1/4-cup is your “part” then use 1/2-cup mayonnaise, 1/4-cup honey and 1/4-cup brown mustard. Stir and use for dipping Snake Bites or other gluten-free nuggets. It’s good on fish too. Another easy idea is to combine 1/4-cup softened margarine with a squirt of brown mustard and mix until creamy. This is nice on vegetables like broccoli or cauliflower and also good on fish or chicken. Plain brown mustard is divine with leftover ham. 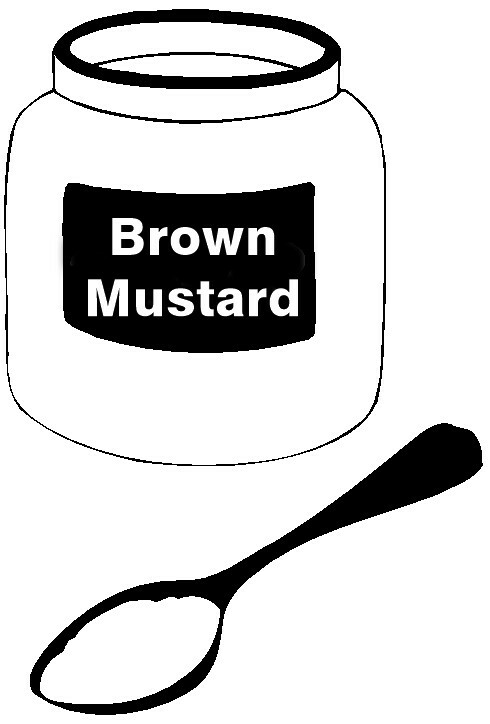 If you’re replacing dry mustard with prepared mustard then 1-teaspoon dry is equivalent to 1-tablepoon brown mustard. This works well in most, but maybe not all, applications. When I make homemade salad dressings or mayonnaise I always substitute brown mustard for dry mustard. It gives them a special flavor that you can’t get anywhere else. 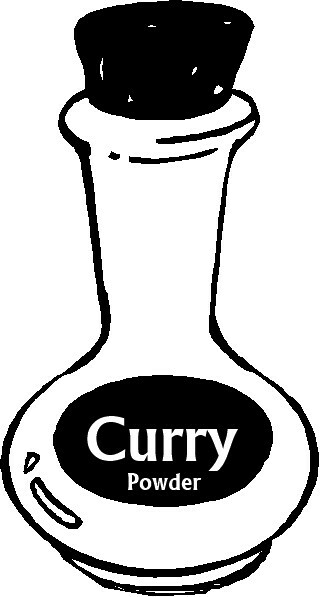 I LOVE all things curry. I like red curry, green curry, Indian curry, Thai curry, African curry, English curry. For me it is one of the most marvelous flavor combinations human beings have ever designed. In case you didn’t know, curry powder is not a specific spice. It’s a complex combination of several spices including cumin, coriander, turmeric, mustard, ginger and fennel, among others. 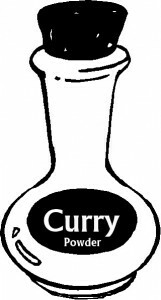 There are lots of recipes for making your own curry powder, but I don’t usually bother. I buy large jars of McCormick curry powder from my local Sam’s Club and then doctor it up at home. I prefer hot curry so I almost always add red pepper flakes or ground red pepper to whatever I’m currying. I’ve found that I achieve amore authentic flavor when I also add onion powder along with the curry powder, in equal measures. For instance, if a recipe calls for 1-teaspoon of curry powder, I also add 1-teaspoon of onion powder. The onion powder is slightly sweet and seems to bring out the full flavor of the curry powder. Another tip is to add a small amount of Worcestershire sauce to anything you’re currying. Worcestershire sauce is made with tamarind, which is a traditional ingredient in many Indian curries. It adds an acidic note to homemade curry that sparks your taste buds. To bring out the full flavor of your curry powder try frying it in a little oil or margarine while you’re preparing the recipe. It only takes about 30 seconds of frying for the curry to develop a richer, fuller flavor. Be careful so the curry doesn’t burn. For flavoring meat and roasted vegetables, this is one of my go-to convenience foods. It makes burgers taste like steak. It makes roasted broccoli taste like restaurant food. It makes simple sautéed chicken breast taste like you made something special. The store-bought version is high in sodium, and not as cheap as regular salt. Worry not. I have a recipe for it that allows you to prepare it at home for a fraction of the store-bought stuff. Plus, you can use a lower-sodium or lite salt or even sea salt instead of regular salt. This gives you a lot of control over the finished product. In addition, it is free of MSG. Mix all together in a clean, empty spice jar and use as desired. Many years ago a reader sent me this recipe and I’ve happily used it ever since. I’ve shared it in the past and recently became aware that it is from Todd Wilbur’s Top Secret Recipes collection. It’s good to give credit where credit is due. I usually prepare a quadruple recipe and use a lite salt that has 1/3 of the sodium of regular salt. I use it most often on plain meats when I don’t have the wherewithal to do anything fancier. So if you find yourself in a rut. If your own cooking tastes insipid. If you’re really tempted to bust the budget with a trip out to eat, then I recommend you give some of these seasonings a try. They’re all affordable. They can all be found at your local supermarket. They all make your own home cooking taste like something you’d like to eat. Beat food fatigue, and give one of these ideas a try. Thank-you for these great ideas Miss Maggie. It’s all about attitude isn’t it? I so appreciate your point of view in making the most of what you have and can afford. I used to follow your old blog, and was so happy to find you again. I have enjoyed many of you GFCF recipes and suggestions. Hi Beth. You make a very good point. I think attitude plays a much larger role in living and cooking on a budget than I understood when I was younger. I think GFCF cooking is similar in that respect. In both cases I have a choice. I can spend my brain power feeling sorry for myself, because of all the things I can’t have. Or, I can spend it appreciating what I CAN have and learning to turn what I can have into something special. I’d rather be happy with what I do have instead of bitter because of what I’m missing out on. To me this is the foundation of frugal abundance. Attitude is everything. Great ideas for anyone in a food rut! The Homemade Seasoned Salt is great. I just use ground mustard seed instead of the onion powder and it taste great.